Countries like Yemen (149th) and Afghanistan (148th) demonstrate that deep internal conflict, often with external intervention, has a devastating impact on prosperity. However, there is a more positive story: that of the rapid flourishing of prosperity that is possible when peace finally comes. Sri Lanka has achieved the biggest rank improvement in the Prosperity Index over the past decade, rising 33 ranks to 55th since 2007. 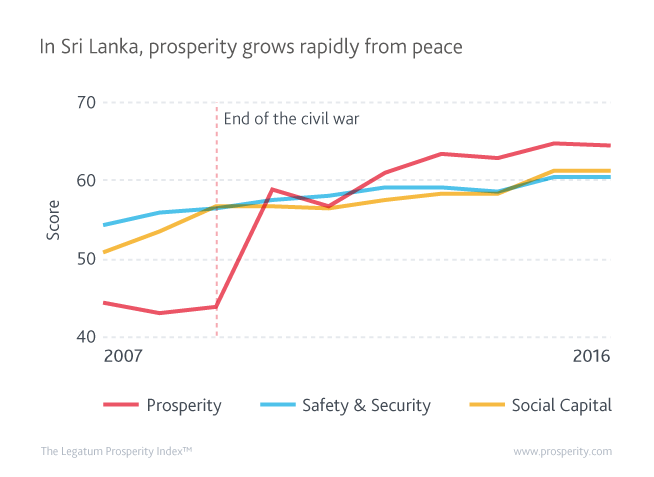 The end of the civil war in 2009 brought the beginnings of a peace that has allowed Sri Lankan prosperity to flourish. The country has risen from 145th to 83rd in Safety & Security, and Health, Economic Quality, and the Business Environment have improved. However, what is most striking is the way Sri Lankan society had begun to heal itself as war drew to a close. The country has risen from 63rd to 19th in Social Capital as trust has strengthened and altruism grown. Those reporting they had helped a stranger has risen from 43 percent in 2007 to 61 percent today.